From the different nutrients that are needed by plants we have known for more than 4 decades that potassium is of critical importance to flowering/fruiting plants. Potassium is one of the most highly limited nutrients in soil due to its high mobility and great increases in yields have been achieved with both potassium fertilization in soil and the use of properly balanced nutrient solutions containing enough potassium in hydroponics. But how important is potassium and what is its ideal concentration in hydroponic nutrient solutions when growing flowering plants? Today we are going to take a look at the scientific literature about potassium and what the optimum levels of potassium for different flowering plants might be in order to maximize yields. There are many studies in the scientific literature dealing with the effect of potassium on various flowering plants. Earlier evidence from the 1980s pointed to optimum concentrations of potassium being close to the 160-200 ppm range. The book "mineral nutrition" by P.Adams (here) summarizes a lot of the knowledge that was available at the time and shows that for the growing techniques available at the time using greater concentrations of K was probably not going to give a lot of additional benefit. However newer evidence from experiments carried out within the past 10 years shows that optimum potassium concentration might depend on a significant variety of factors, from which media, other nutrient concentrations and growing system type might play critical roles. 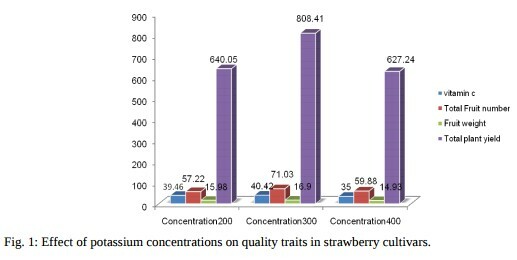 For example study on strawberries in 2012 (here) showed optimum concentrations of K to be around 300 ppm for strawberries and the optimum media to be a mixture of peat+sand+perlite (image from this article included above). Evidence from experiments on tomatoes (link here and image from this article above) also shows that for tomatoes the actual optimum concentration of K might actually be larger under some condition with the optimum in this study in terms of fruit quality and yields being 300 ppm. In this last case the tomatoes were grown using a nutrient film technique (NFT) setup. However there have also been studies under other growing conditions - like this one on reused pumice - which shows that increasing K concentrations to 300ppm can actually have detrimental consequences. In this case tomatoes fed at 200, 290 and 340ppm of K had very similar results when using new substrate but the old substrate heavily underperformed when high K concentrations were used. Papers published on the effect of different K concentrations in melons (here) and cucumbers (here) also point to optimal concentrations in the 200-300 ppm range and for the optimum N:K ratio to be between 1:2 and 1:3 for these plants. 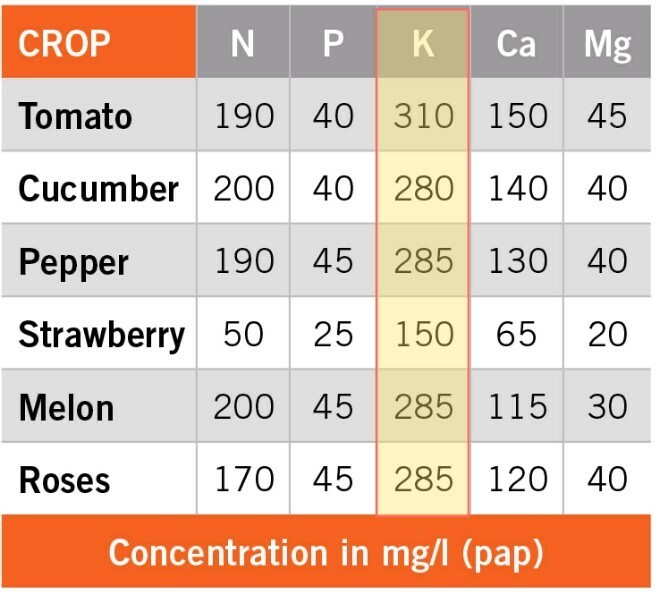 This is probably the reason why you will often find suggested nutritional guidelines for flowering plants - like those below taken from here - mostly suggesting K concentrations in the 250-350ppm range. However you will often find that they directly contradict research papers, like this guideline suggesting K of 150 ppm for strawberries while we saw in a recent paper that 300ppm might be better. This is most probably due to differences in the sources used which might have used different growing systems or plant varieties which responded to other conditions better. All in all the subject of K concentration in hydroponics is no simple one. 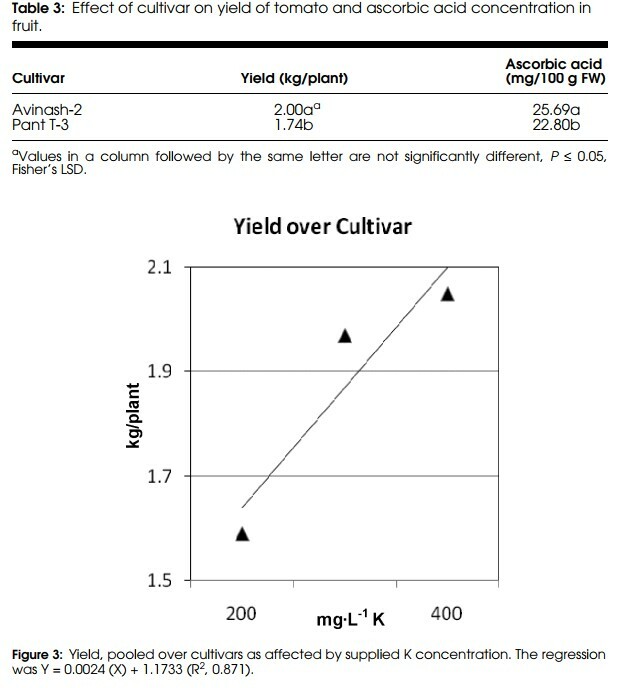 Using low K will limit your yields tremendously but increasing your K very high can also harm your plants, especially depending on the type of media you are using. In general aiming for a K concentration between 200-250 ppm is safest but in many cases increases to the 300-400ppm range can bring significant increases in plant yields. A careful study of the available literature and the actual growing conditions that the plants will be subjected to will be key in determining what the best K concentration to use will be. Alternatively carrying out adequately designed experiments under your precise growing environment will help you carry out an evidence-based decision about what K concentration to use. Great write up, Dr F! Can you answer a question? If I have a dry water-soluble nutrient mix, and it states so many percent potassium whatever, how would I calculate the potassium PPM in the final solution?